The Ministry of Industry and Trade (MoIT) on September 20 decided to remove 675 out of 1,216 business and investment conditions under its management during 2017-18. The number, which is the highest-ever record in the MoIT’s history, has been announced after a two-week review of business conditions in fields and sectors managed by the ministry, accounting for 55.5 percent of the total current business conditions. According to Minister of Industry and Trade Tran Tuan Anh, the streamlining of business conditions will be the core of the ministry’s administrative reform process in the coming time, aiming to improve the legal system as well as investment and business environment. After scrutinizing 27 fields and sectors under its management (excluding car manufacture and import), the MoIT has decided to ease conditions for doing business and making investment in 17 fields and sectors, including petrol and oil; gas; explosive precursors; liquor; cigarette; food; electricity; temporary import for re-export of frozen food; commercial franchise; logistics; industrial precursors; goods exchanges; commercial assessment; multi-level marketing; e-commerce; and industrial explosives (including also disposal activities). Meanwhile, investment and business conditions will be kept unchanged for the remaining 10 fields and sectors, namely activities involving the use of industrial explosives or explosive precursors; rice export; temporary import for re-export of excise tax-liable goods; temporary import for re-export of goods on the list of used goods banned or suspended from import or export; mineral trading; goods sale and purchase of FDI enterprises; oil and gas activities; energy auditing and technical inspection of machinery and equipment subject to strict requirements on occupational safety; and production of military uniforms for foreign armed forces. As explained by the MoIT, the removal and simplification of investment and business conditions have been conducted based on five principles. First, business conditions must be designed and applied along the line of gradually changing the method of state management after the post-customs clearance inspection mechanism. Second, the imposition of investment and business conditions must take into account market accession requirements under the country’s international commitments. Third, any investment and business conditions, even if they are actually necessary, must satisfy the criteria prescribed in Article 7 of the 2014 Investment Law. Fourth, the feasibility of plans on removal and simplification of business and investment conditions, state management agencies’ resources for their implementation, and the possibility to decentralize their implementation to localities must be carefully assessed and reviewed. Fifth, the streamlining of investment and business conditions must be combined with administrative reforms, especially institutional and administrative formality reform. Earlier in October 2016, the MoIT issued Decision 4846, cutting down 15 administrative procedures and simplifying 108 others. In September of the same year, the ministry enacted Decision 3648 promulgating a list of imports under its state management which are subject to pre-clearance inspection in terms of quality, technical regulation conformity and food safety. With the promulgation of these documents, of 720 HS codes subject to pre-clearance inspection under the management of the industry and trade sector, 420 were removed, accounting for 58.3 percent. The MoIT is now managing only two types of products which must undergo inspection before customs clearance. They are explosive precursors and food products subject to pre-clearance inspection in accordance with the Law on Food Safety. To enhance transparency, the MoIT has clearly identified 8-digit HS codes for all these items. To eliminate monopoly and encourage socialization of inspection activities, the ministry has designated 11 qualified units to conduct quality inspection of imported food safety and two labs to carry out state inspection of industrial explosives. Particularly for energy efficiency labeling, the MoIT has allowed all laboratories at home and abroad, regardless of whether they are in-house labs and independent labs, to conduct inspection of energy-consuming equipment and devices, provided they meet law-prescribed conditions. To reduce the frequency of inspection, risk management principles have been applied. For imported food under the ministry’s management, in case batches of goods of the same type and origin pass five inspections in a row, from the 6th importation on, only documentary examination will be required while sampling will be no longer needed. In 2016 and the first half of 2017, 2,325 batches of imported foods were entitled to reduced inspection under which the average time required to fulfill customs clearance procedures is just two working days, instead of 12 working days as per normal inspection. For batches meeting the conditions for documentary examination, it will take only two hours before a notice of state inspection of imported foods is handed over to importers. The MoIT is now considering lessening the condition for imported foods to enjoy exemption from sampling to passing three consecutive inspections. Additionally, it will work with the Ministry of Health and the Ministry of Agriculture and Rural Development to draw up a list of food products and goods exempt from pre-customs clearance inspection or subject to documentary examination only. For steel, the reduced inspection mechanism has helped importers shorten the required customs clearance time by 3-4 days while saving around VND 2 million in testing expenses for each goods batch. From October 1 this year when the application of post-clearance inspection mechanism to steel is planned to start, the time for customs clearance will be further shortened. Minister of Industry and Trade Tran Tuan Anh affirms that in the coming time, the MoIT will continue listening to opinions of the business cycle in order to promptly handle newly arising issues. 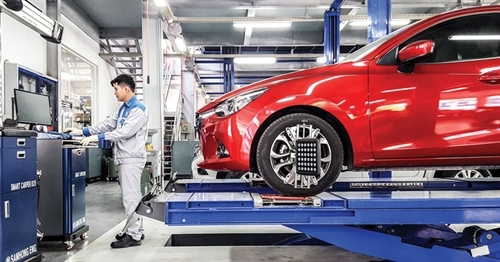 The MoIT will further shorten the list of goods subject to specialized inspection, both pre-clearance and post-clearance inspections. As for commodity items which must undergo inspection, it will enhance the application the post-clearance inspection mechanism and risk management principles.